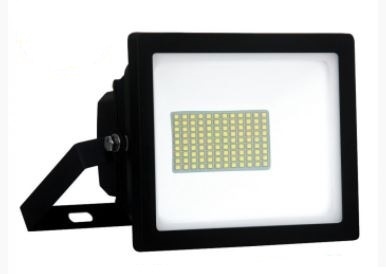 This is a 75w LED floodlight with 9625 lumen output with SMD and dusk till dawn sensor technology. Cost effective - This model offers up to 85% energy savings compared to the equivalent halogen model, more than paying for itself over time. Maintenance free - No more lamp changes for its entire lifespan. Convienient - Comes with 50cm rubberised fly lead for easy connection. Dusk Till Dawn - Intelligent sensors mean the light will automatically light up dark nights without wasting money in the day. High Performance - The high lumen output means this is an extremely powerful light. For your peace of mind this product comes with a 14-day money back guarantee and 3-year replacement warranty. This light has lit up my big yard and more. Good powerful light with the added bonus of a built in photocell.